Frank Short checked out Sheffield Film and Comic Con this weekend, with celebrity guests, talks, cosplay and of course, stalls upon stalls of merch. I was glad to find that the quality has not dipped since it was first held last year. As is always advisable, I had an early-bird ticket and managed to get in before the midday rush. The staff were friendly and getting in was not much hassle at all, proving once more that Showmasters really know how to plan a large-scale event. Upon entering, I was instantly immersed in a bustling atmosphere and a buzzing community of fans gathered from all around the UK. One of the most exciting things about any con is normally the celebrity guest list. Last year, Sheffield welcomed former Doctors Paul Mcgann (I got his autograph) and Sylvester McCoy, Lord of the Rings star John Rhys-Davies and Red Dwarf veterans Chris Barrie and Robert Llewellyn. The line-up this year wasn’t quite as extensive, but still had some pretty big names in the form of David Prowse, Colin Baker and Robert Englund; Darth Vader, the sixth Doctor and Freddie Krueger respectively. As per usual, there were a number of free talks to go to throughout the day. I managed to catch Robert Englund’s Q & A session, and while I’m not personally a big horror fan I actually found it quite interesting. Englund was very warm and forthcoming with the many ‘Nightmare on Elm Street’ fans that had flocked to see him, providing insights such as how the effect on his character’s voice was achieved, what originally drew him to the role and his opinions on modern horror. I think it’s safe to say this session went down a treat, as when it was over the crowd went nuts. You always see a wide range of cosplayers at these things (if the word cosplay baffles you, it’s basically fancy dress but with more of a performance element). There are the laid back ones who just buy an outfit and wear it proudly, but then there are the hard-core cossers who put a ridiculous yet commendable amount of effort into homemade get ups. You also get the cheaters who just happen to look uncannily like the person they’re dressing up as (I saw one guy who I swear was David Tennant’s twin brother). Notable characters attending on Sunday were the terrifying Freddy Krueger, the obligatory Stormtrooper and the ever popular Deadpool, all more than willing to stop and have their photo taken with visitors. 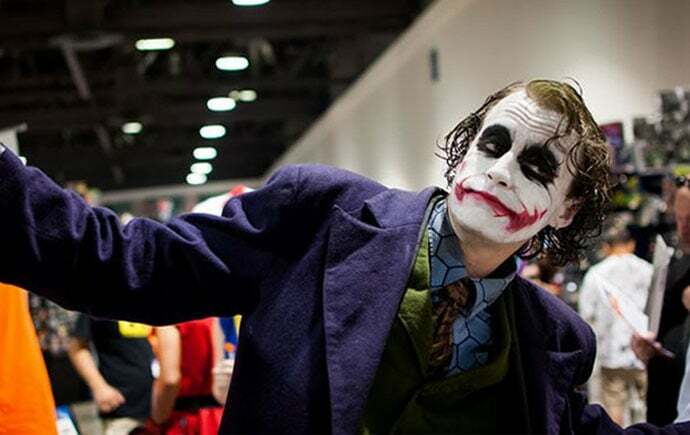 The cosplay community is particularly active at this convention, and this year a talk was once again given on the subject by a group of seasoned enthusiasts. This offered advice for beginners on aspects such as choosing a character, the best fabrics to use, how to effectively prepare for your role and various other hints and tips. I found it to be a bit more informative and helpful than last year’s talk, especially in terms of budgetary advice. What really makse a con in my view are the stalls, and while Sheffield Comic Con may be smaller in scale than the likes of London or Manchester there is still a gallery of really cool stuff to browse. From rare comics, to artwork, to replica baterangs, the temptation to purchase all manner of appealing memorabilia to take up storage in your house is quite overwhelming. So much so that all day long I kept chanting in my head: ‘you have enough stuff Frank, you have enough stuff Frank’. I did however come to see the wisdom in my other half’s advice, namely that money is for spending, and proceeded to indulge myself. Sheffield’s own Film and Comic Con offers a lot for hard-core fans and there’s also plenty to entertain the curious and inquisitive. It has proven a hit for the second year running and will be returning in 2016. If you’re local to the Steel City and have never given conventions a go, you need look no further than your own doorstep.